One of my most vivid memories as a child is riding in the car with my dad and going through his music collection in the glove compartment. 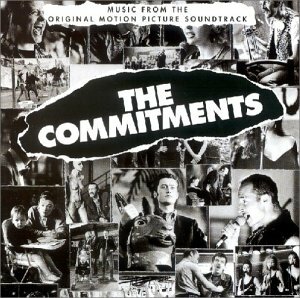 Inevitably, I would come across the The Commitments, which was one of his favorite soundtracks to listen to (and still is). I’d stare at the photos on the CD cover, confused as to who these people were and why I had never heard of them before. My father explained to me that this was the soundtrack to an independent film about a group of working class Dubliners who form a soul band. We would drive and listen to these Irish men and women sing classics like “Mustang Sally”, “Land of a Thousand Dances”, and “In the Midnight Hour”. I enjoyed the music so much that I couldn’t wait to watch the movie! When I was old enough (the film is littered with profanity and sexual innuendos), my dad let me watch it. Frankly, I was a little disappointed. The actors’ accents were pretty thick so I couldn’t understand half of what they were saying and the film didn’t speak to me like I thought it would. Don’t get me wrong, though. It was an interesting concept for a film (like an Irish version of That Thing You Do) and there were several comedic moments. The band’s manager, Jimmy, is constantly pretending to be interviewed by a newscaster when he’s alone (usually in the bathroom) and his Elvis-loving father brought a smile to my face. But as a pre-teen, I couldn’t understand why the band members fought all the time and how they could let their egos get in the way of their success. Years later, I realized that’s exactly what the film was going for: to show us the price of fame. Every now and then, I’ll check out the film from the Gabriele Library and watch it. Maybe it’s because The Commitments is a common interest my father and I both share, or maybe it’s because the music is so catchy. The cast, who were mostly unknown at the time and chosen for their musical talent rather than acting ability, do a great job of making their eccentric characters come to life. The lead singer of The Commitments is Deco, played by Andrew Strong. Only 16 at the time, his character looks, acts, and eats like a slob; yet, when he sings, you forget all of that and are captivated by his voice. His rendition of “At the Dark End of the Street” is truly memorable. If nothing else, watch this film for the music. The Gabriele Library is looking for volunteers to participate in a focus group on Wednesday, February 19 @ 2:00 p.m. in the Library Media Classroom. You must be an Immaculata traditional undergraduate student to participate. The focus group will last no longer than one hour and will focus on your perceptions of librarians and reference services. We encourage you to attend and share your thoughts! Starring John Cusack, Ray Liotta, and Amanda Peet, Identity starts off like any horror film. A hodgepodge of individuals (including a limo driver, an actress, a prostitute, and a cop) are stranded at a seedy motel during a thunderstorm. One by one, they start dying. As the remaining victims scramble to ascertain who the murderer is and stop him/her from killing anyone else, we are presented with numerous questions. First, is one of the stranded travelers the murderer? None of the characters seem all that trustworthy, except maybe a caring father who is too busy tending to his injured wife (who was struck by the limo driver’s car) and her son to worry about a killer on the loose. But as the movie progresses, we realize that any of these people could be the murderer. After all, how much do we really know about them? Another possibility is that maybe none of these individuals are involved and instead, a deranged serial killer is on the loose. Most of the film takes place at this motel, but every once in a while, the film switches gears and shows us an insane mental patient being interrogated by a judge, a psychiatrist, and a few attorneys. Is he the murderer? How is the man related to this massacre? For that matter, why are these specific individuals being targeted? Is it just a random coincidence that they are all stuck at this motel, or are they all connected somehow? These questions and more are what make Identity so fascinating. As the movie progressed, I found myself growing more and more interested in solving the mystery. By the end, we the audience receive not one, but TWO incredible twist endings that explain everything. I was blown away by the ending and immediately wanted to watch the movie again from this new enlightened perspective. Like an Agatha Christie novel, the mystery is what drives this movie just as much as the suspense. It’s not scary as much as it is psychologically mind-bending, designed to play with your notion of reality. It is one of my favorite films! I highly encourage you to check it out.